In 2010, a crack began spreading across the Larsen C ice shelf, an ice complex located on the Antarctic Peninsula in the Southern Ocean. Members of the Antarctic research group Project MIDAS detected a new, 6-mile-long rift that broke off from the 100-mile-long main rupture in early May of this year. If the cracks continues to grow, it is expected that 10 percent of Larsen C’s ice will break off, potentially speeding the destruction of the entire ice shelf. Larsen A and Larsen B, neighbors to Larsen C, crumbled in 1995 and 2002 respectively, and scientists predict the same fate for Larsen C.
Warmer water and air are not just responsible for the cracks forming on Larsen C, but also for the instability of other ice shelves that surround Antarctica. Driven by carbon pollution, the changing temperatures are diminishing the ice that stands between Antarctic land ice and the sea. Scientists fear that losing the protective ice shelves could speed the flow of ice into the ocean, which would in turn increase the rate of rising sea levels. If all of the ice in West Antarctica is lost, sea levels would be pushed up to 13 feet higher, though it would take centuries for levels to reach that point. 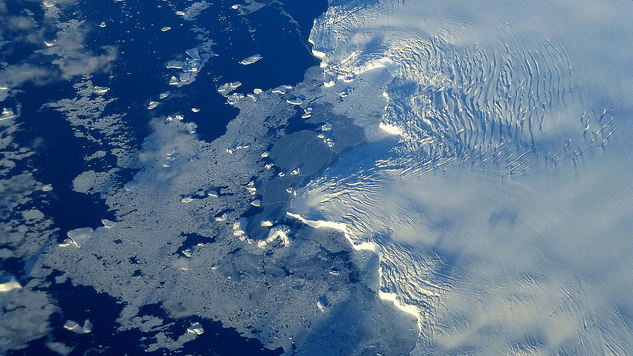 The cracks along ice shelves are not the only signals of this larger change. A seasonal 400-foot wide waterfall and almost 700 drainage systems that undercut ice formations and weaken them further are also shocking indicators of the quickly melting ice. These findings prove the extent of the changes occurring across Antarctica and draw attention to the impacts of climate change.